Cargo Handling: Fitted with four electric hydraulic deck cranes of 8 SWL suitable for grab discharge. Engine: Horten Sulzer oil engine 6 RD 76, 9,600 bhp 15 knots. 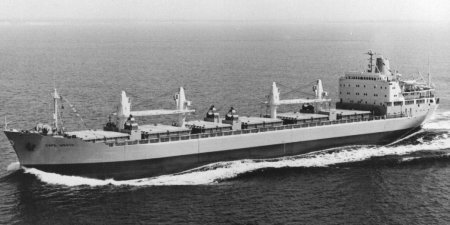 June 1968: Completed by Marinens Hovedverft, Horten (Yard No.162) for Lyle Shipping Co. Ltd., Glasgow. Scottish Ship Management Ltd., Glasgow, managers. 1976: Sold to MacKinnon Mackenzie & Co (Pvt) Ltd., Bombay and renamed CHANDA Indian flag. 1988: 5th May, Laid up at Bombay. 1991: 11th April arrived Kalyanji jethlal Shah Co. at Powder Bunder Shipyard, Bombay to be scrapped. 12th April suffered a major engine room fire.